Today, as a change from dressmaking and the exacting requirements of “FIT” I have started work on a new quilt for my husband’s grand piano. At Christmas there was a Christmas-themed-prints log cabin quilt on the piano but that has now been put away. The next themed quilt is for Valentine’s Day – a quilt featuring lots of layered applique hearts in a variety of floral printed cottons. 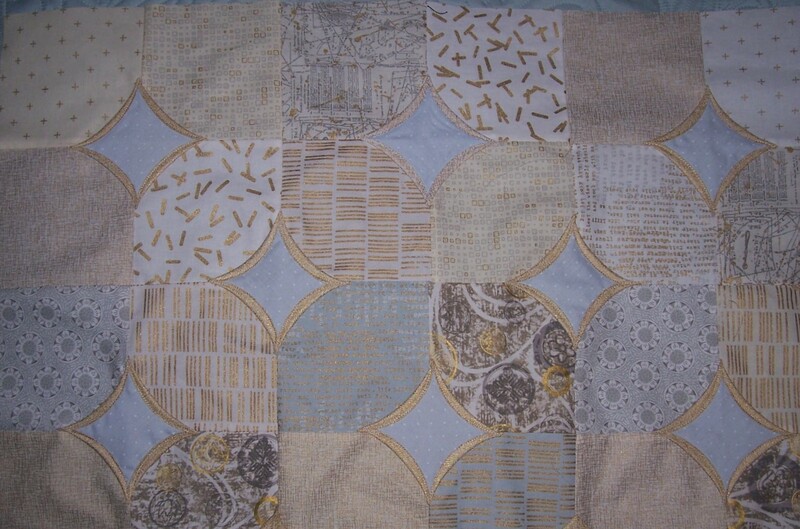 What we really need is something for the interim that will take us up to the “Springtime” quilt. 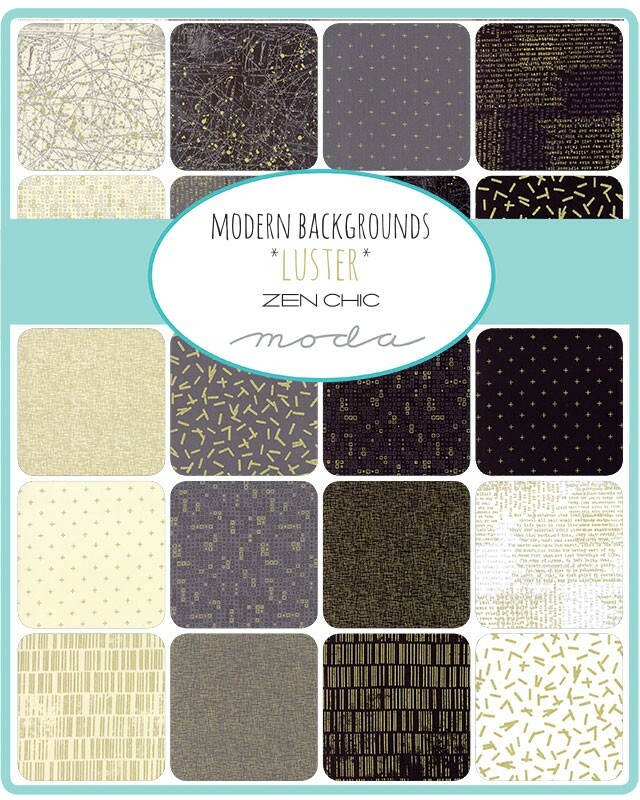 Taking inspiration from the colours of our surrounding countryside I had previously purchased two charm packs by Moda called Modern Backgrounds *Luster*. In addition I also purchased a variety of fat quarters in co-ordinating shades of Taupe and Blue/Grey together with a metre length of plain “Gold” lustre as the basic accent. 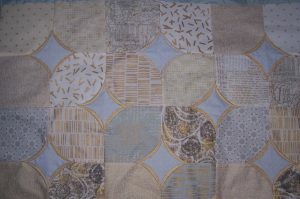 At the time of purchasing the fabrics I had not yet made up my mind exactly which block design I would use. I was wavering between “Disappearing 9 patch” and “3D bow tie/faux Cathedral Window”. Yesterday I was putting away a box of zips when I chanced upon a box of Blue-toned fabrics. On top of the selection was a short length (approximately ¾ yard) of a fine cotton lawn in lightest Sky Blue with White pin spots. Ah ha! Decision made! I would make the “3D bow tie/faux Cathedral Window” blocks and use this lovely Blue as the “window” accent to reflect the delicate shade of the sky at this time of year. 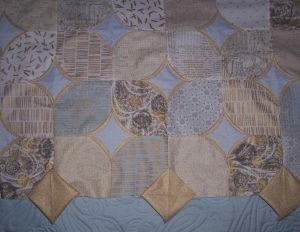 The quilt that I made in Autumn shades uses the same block design so I knew that I would need to make 36 blocks of 4 x 5 inch squares, each with the 3D bow tie/faux cathedral window. These are joined in rows of 6 blocks each with another “window” set in between the rows. I am stitching entirely on the machine and so far have made 12 x blocks. 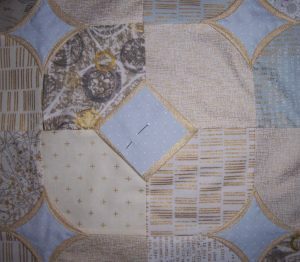 The blocks are coming together nicely and I look forward to getting the quilt completed as soon as possible so that it takes centre stage on the piano until 21st March (excluding Valentine’s Day of course!) when the “Springtime” quilt will take over. Hot on the heels of the Teddy-print pinafore dress I saw this ditsy floral printed pincord in the sale at New Threads Quilt Shop and immediately thought it would be good for another pinafore dress. I bought just 2 metres and got busy. I cut out the dress together with a lining in Cream anti-static fabric. I checked the bumper stash of zips and found a great match in a length of continuous zip tape complete with co-ordinating zip pull. Having changed the threads on the overlocker from Black to Rusty-brown I very quickly overlocked all the raw edges of the pincord before stitching the darts and shoulder seams. This time I also remembered to stay stitch the neckline and armholes. Marking the darts on the lining fabric was a little tricky as it slipped and slid around but I got there eventually. 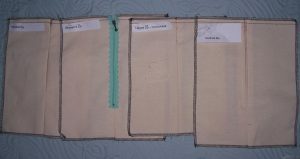 Because the lining fabric is prone to fraying and I did not want to re-thread the overlocker, I used a triple stitch zig-zag to neaten the seam allowances which worked very well, keeping the allowances flat so that they did not curl or bunch up under the needle. Having stitched the darts and shoulder seams of the lining I then placed lining and pinafore dress right sides together taking care to align the lining just a fraction over the pincord so that when I turned right sides out the lining would automatically pull to the inside. With pins at right angles to the raw edges the two were sewn together with 5/8 inch seams around the neckline and each armhole. The seams were then pressed and seam allowances trimmed using my pinking shears. To turn through to right side out is an easy matter of pulling each back through the shoulder to the front. Now I could insert the zip in the centre back. When there is a deep scoop to the neckline I like to set the zip a couple of inches down from the back neck and this is what I did on this occasion. 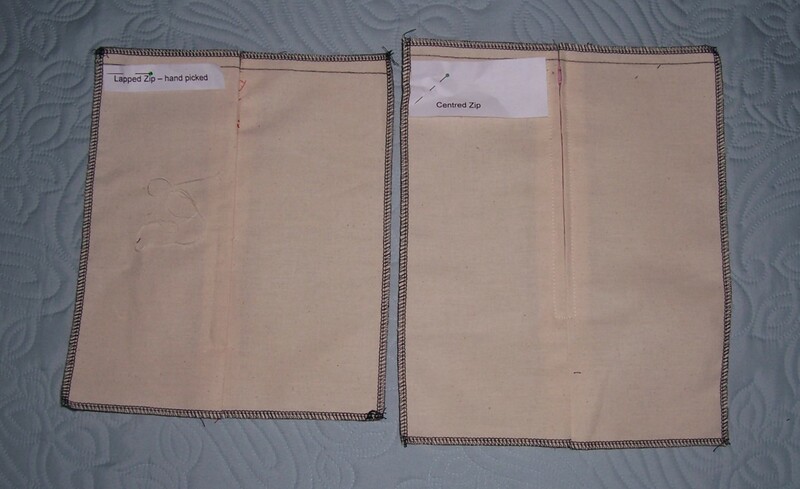 I used a lapped zip insertion and then slip stitched the lining to the zip tape. The side seams are sewn all in one continuous seam. There is a short vent in the hem of the centre back and the lining has thread ties at the side seam hems just to secure the lining to the inside. Hems on both the pinafore dress and the lining are machine stitched. Finally also to secure the lining to the inside, there is a row of top stitching around the neck and the armholes. 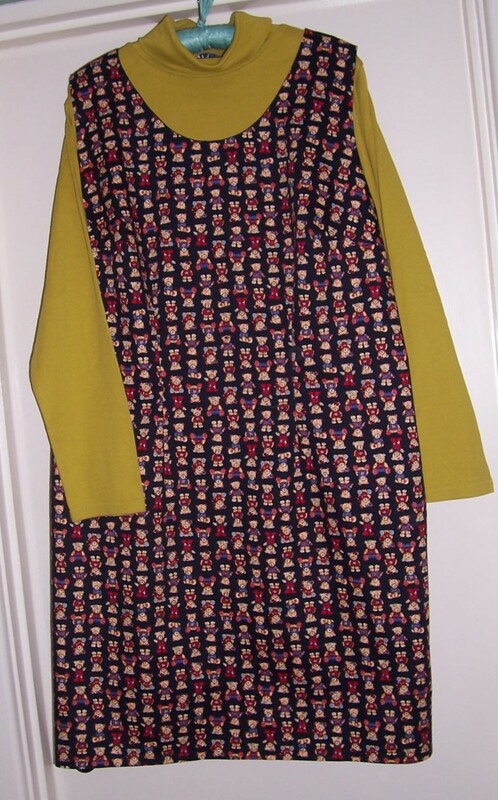 The colourway of this pinafore dress goes well with both my Mustard and Teal polo neck tops so combined with the Teddy print I think I now have sufficient pinafore dresses to see me through the coming cold weather. I usually buy my leggings from Lands End when there is a sale on. However, one of my unspoken resolutions is to continue making more clothes than I buy “off the peg”. 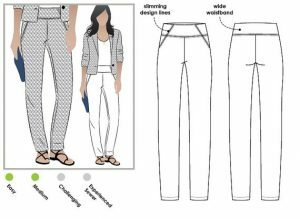 To this end I have ordered the Beth pdf pattern from Style Arc – it was on offer with a discount for Australia Day! 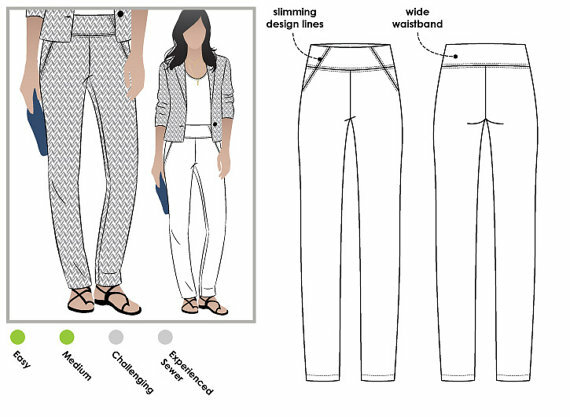 The Beth pattern is a new version of the award-winning Barb Pant. It features a wide waist band with inserted elastic for comfort. The front design lines add style to this pant which is perfect for the office or the weekend. 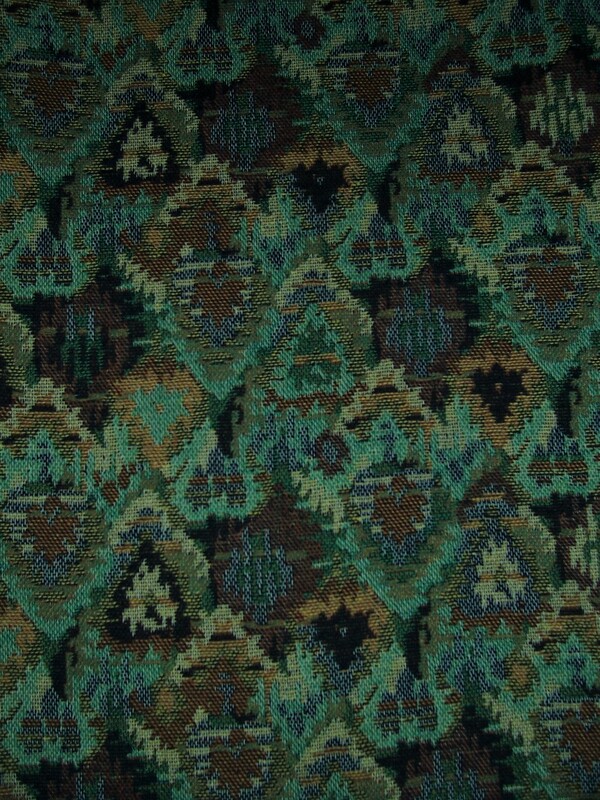 This pattern has negative ease suitable for a stretch woven fabric (e.g. Bengaline). I have not encountered Bengaline fabric before and a search revealed the following: The fabric was first produced in Bengal, India, from where it gets its name. The French began to trade for the fabric, and its popularity rose in the late 19th century as a material for dresses. It is often used in children’s clothing as well because it does not wear out easily. Bengaline was first produced mostly as pure silk. Cheaper textiles, however, were soon woven in with the silk because the resulting appearance still looked like silk but cost less to manufacture. The ribbing that the material is known for can be made by first using a thin or fine textile for the warp, or vertical yarn when weaving. A heavier weft or horizontal textile is then woven in to create the raised rib. Bengaline can be both stretchy and durable due to this type of weave. Bengaline is a fantastic fabric for making all type of garments – particularly skirts, dresses, trousers and jackets. Having searched the internet I found that Minerva Crafts stock the fabric. Their Bengaline fabric is made from polyester and lycra and stretches down the length of the fabric (rather than stretch across the width like most stretch fabrics do). 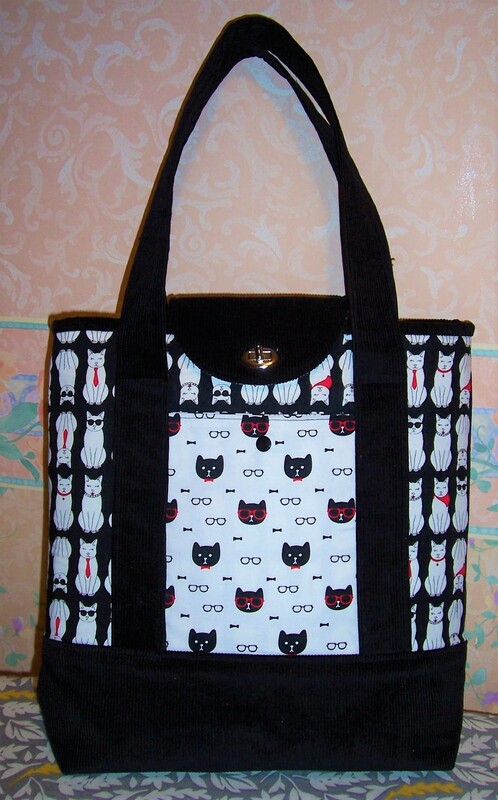 It is a good medium weight and doesn’t require lining. The fabric is machine or hand washable. 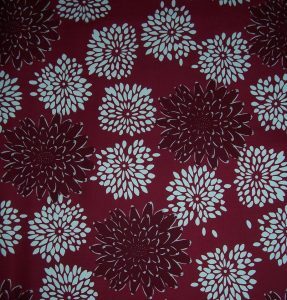 I ordered 2 metres in a Deep Purple colour, again a special offer price of just £2.99 per metre. The Beth pattern also calls for some 1 ½ inch wide elastic. Another search online and I have purchased 5 metres at a price of just £3.99 – enough for 5 pairs of trousers! Another Saturday, another workshop! This week we explored zip insertions. 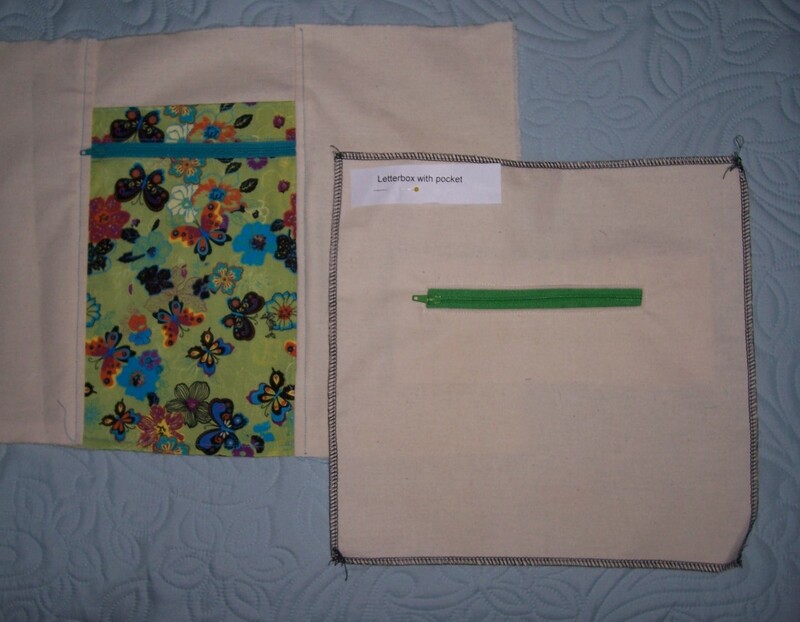 I was joined by Janice and Paula (who last week did battle with a “Toile”) as we settled down to 12 inch squares of fabric and a variety of 8 inch zips. First to be tackled was a “Centre zip insertion” as used in dressmaking for centre back, or indeed for centre front of garments. 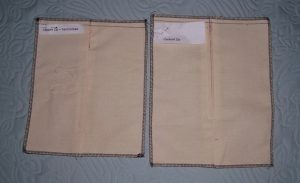 Next was a “Lapped zip insertion” used for centre back or side closure in skirts and dressmaking. This method is also great for use on the back of cushion covers. I then showed a decorative trim zip and demonstrated how to add a zip pull to a length of continuous zip. After adjournment for a warming lunch at the “Ewe and I” cafe we discussed which types of zip insertions Janice and Paula would like to cover next. 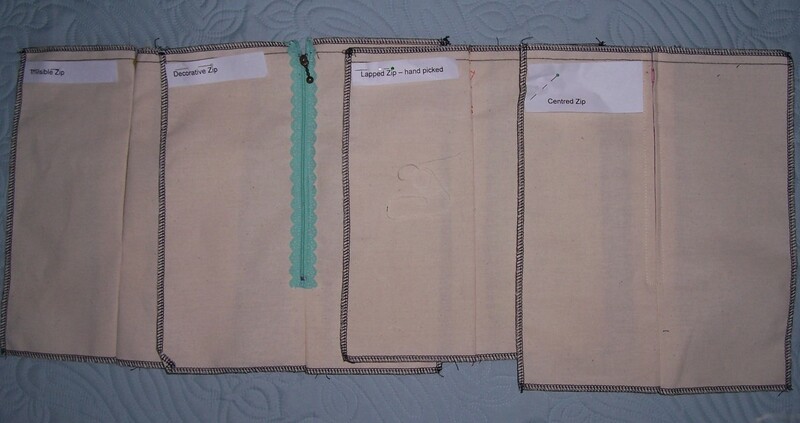 The “how to” of decorative trim zips and invisible/concealed zips are covered in the workbook but we proceeded to make a “Letterbox zip closure with Concealed Pocket” followed by my “signature” insertion, “ZIP & SLIP Pockets” both of which are particularly useful in bag-making. Janice and Paula were both able and enthusiastic students finishing the class with completed samples. 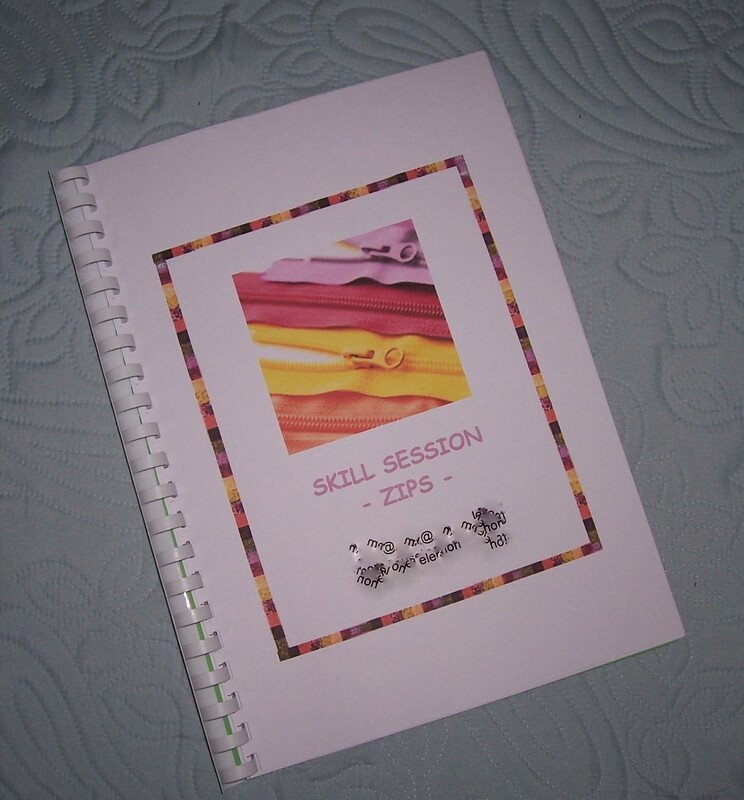 Armed with their comprehensive workbooks they can now go forward and complete a variety of precision zip insertions with confidence. In anticipation of tutoring a workshop tomorrow using the New Look pattern to make a toile, I thought it would be a good idea to wear a version of a shift dress. 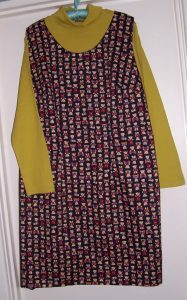 I used my TNT version of the Prima magazine “Go Anywhere Shift Dress” as my preferred version of a basic shift dress. This is only because I have already fine-tuned the fit for this one whereas to date I have not got around to making a toile of the New Look pattern. That is one of those projects that just keeps getting put to the back of the queue. I knew that I had limited time to make the pinafore dress so just pulled a length of polyester blend gabardine twill fabric from my stash. It happened to be this charming print of multiple teddy bears. I remember making a child’s dress from the original yardage – many years ago as that child is now in her third year at University! 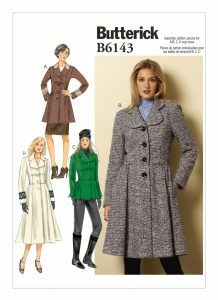 So does using this fabric from my stash count as credit against my purchase of fabric to make the Butterick B6143 coat? 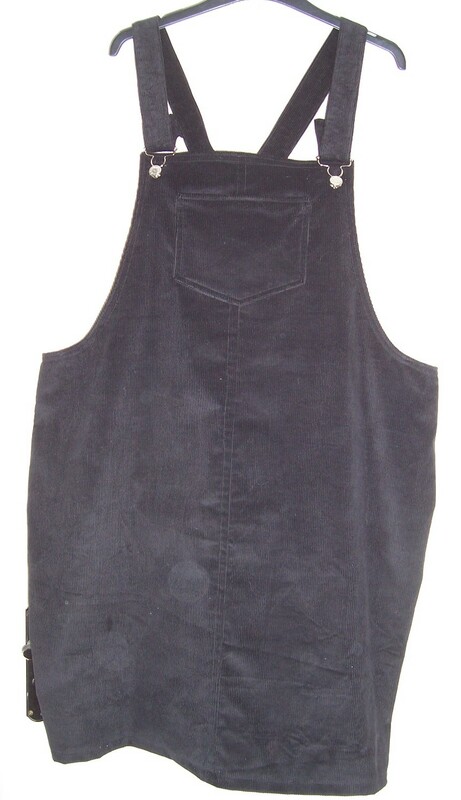 To ensure that the pinafore dress would fit over a lightweight polo neck sweater I added ¼ inch to each side seam, dropped the armscye slightly and re-drafted the neckline into a more generous scoop at the same time maintaining the width of the shoulders. Prompted by the fact that the Corduroy Dungaree dress tends to “grab” at my underwear, I made this dress fully lined with anti-static lining from New Threads Quilt Shop. 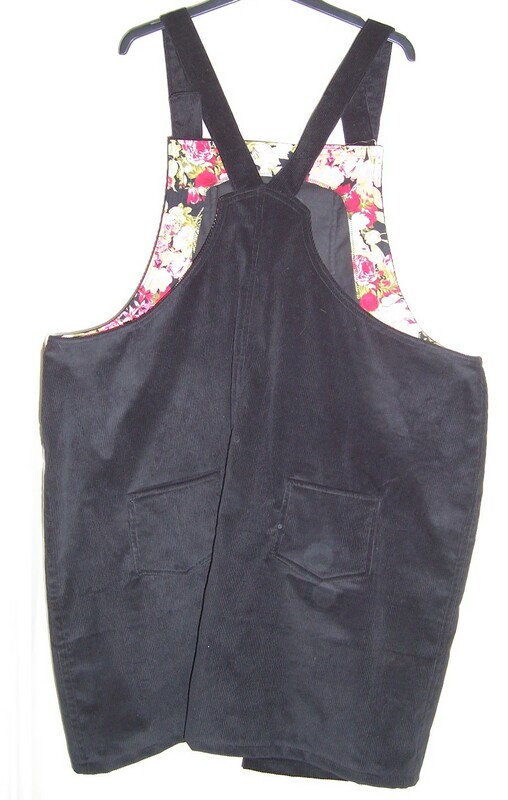 There is a centre back “lapped” insertion zip and a short hem vent in the centre back seam. The dress fits well and is easy to put on and pull off due to the great lining. I can foresee that I will get a lot of wear from this simple garment as it will go with many different tops and opaque coloured tights. The style will also work well made up in cottons and linens as a Summer dress- roll on warmer weather! 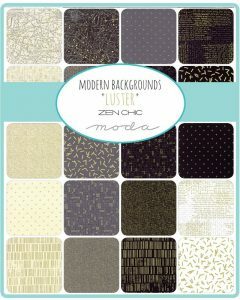 “No Fashion Fabric & Pattern Purchases in 2017” – That plan didn’t last long! I said in a previous post that I wanted to start using up my stash and to that end I would not be buying any new fashion fabric or patterns. Well that plan has gone bust! Today I wore one of my standard dresses with the full circle skirt. As the weather was cold and wet I needed to have a coat. The only long length coat that I possess is a cashmere and wool blend which would be too slim-fitting to wear over the dress. I had a little think – what I need is a coat with a similar full circle (or near about) skirt that is made in a fabric that is not too hot, not too cold and not too heavy or too light. I need to make my own. I visited Fabricland in Salisbury and having checked the pattern books found Butterick 6143 which is exactly what I need. I checked out comments and reviews on the Pattern Review website and decided to “go for it”! 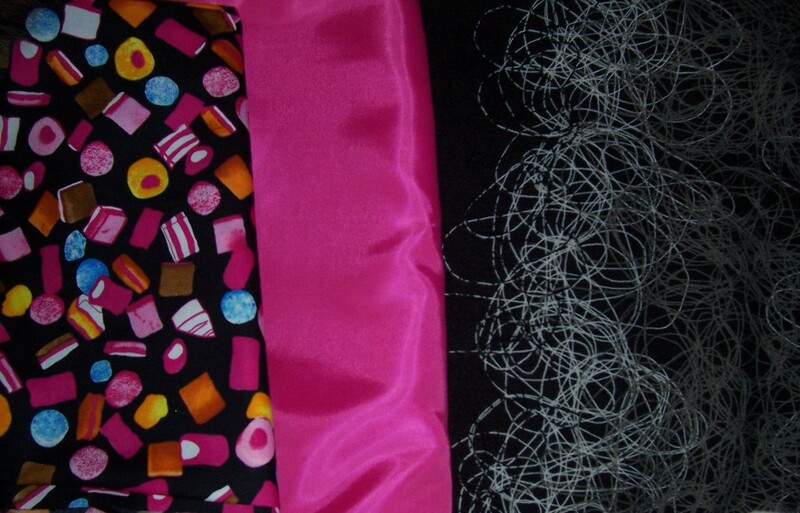 I purchased 4 metres of a Black embroidered wool blend fabric, 4 metres of Vilene 410, 4 metres of Bright Cerise Pink lining and 1 metre of Black background Liquorice Allsorts print to make the contrast piping. I have a couple of more urgent projects to complete but am hoping that I can get started on my new coat within the next two weeks. Watch this space! 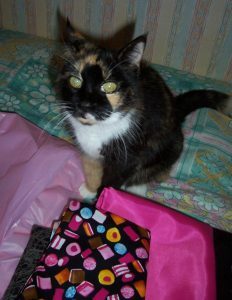 Meantime, here is a picture of my “Sewing Supervisor” aka “JAZZ” my cat. She loves to keep me company when I am busy stitching. Sometimes she watches from her station on the ironing board and others she likes to sit on my lap as I machine stitch the fabrics. 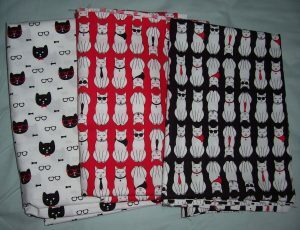 As mentioned in my previous post, one of the final fabric purchases of 2016 was some fabulous cat print by Michael Miller. I have combined the quilting weight cotton with a remnant of Black corduroy that I had left over from making the dungaree dress. 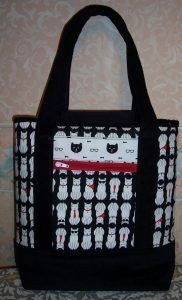 I have designed the Maggie bag in 3 sizes and this iteration is the Medium size. The finished size is 12” wide x 14” high x 3½“ deep. There is not a great deal to say about the bag and its construction as the method is the same as that used for the “Maxi” size. I used a medium-weight fusible interfacing (Vilene F220) on all pieces plus some fusible Bosal ® for the main bag panels and flap. I love using this foam wadding on bags as it makes them very sturdy and able to stand open, ready to fill! 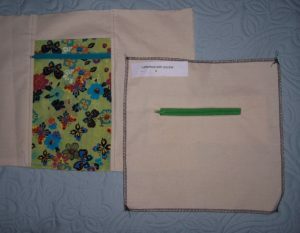 On the front there is a slip pocket that has a plastic popper closure and on the reverse a “zip and slip” pocket. The flap has a nickel twist lock. Inside I used my signature 3 panel lining that incorporates a divided slip pocket on one side and a “zip and slip” pocket on the other. 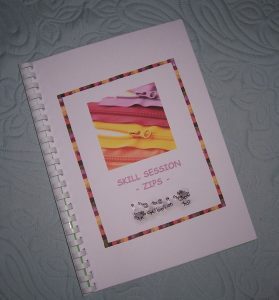 My New Year’s Resolution – STOP buying patterns and fabric! Well I realise that I won’t be able to last an entire year without buying any fabric especially as I know that I will need to stock up on things like fusible interfacing, wadding, anti-static lining etc. But, I do need to start using up some of my stash of fabulous fabrics. In anticipation of the moratorium on fabric buying I did indulge on one of the last days of 2016 and purchase some SALE fabrics from New Threads Quilt Shop. This first selection of cat prints are by Michael Miller, a favourite designer. 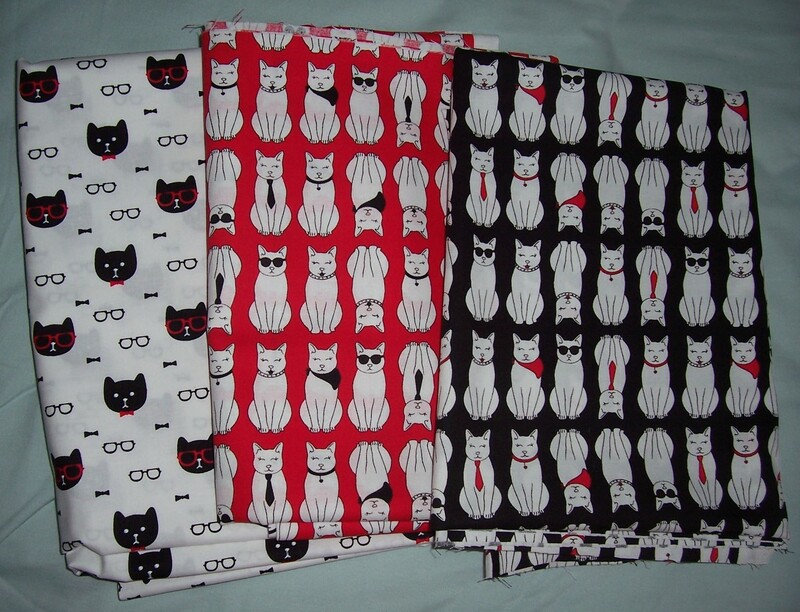 I bought 2 metres of the White background to use as linings for bags, 1 metre each of the Red and Black background prints. I have already started work on a medium-sized Maggie bag using the Black background yardage which I will combine with some of the Black corduroy in my stash. 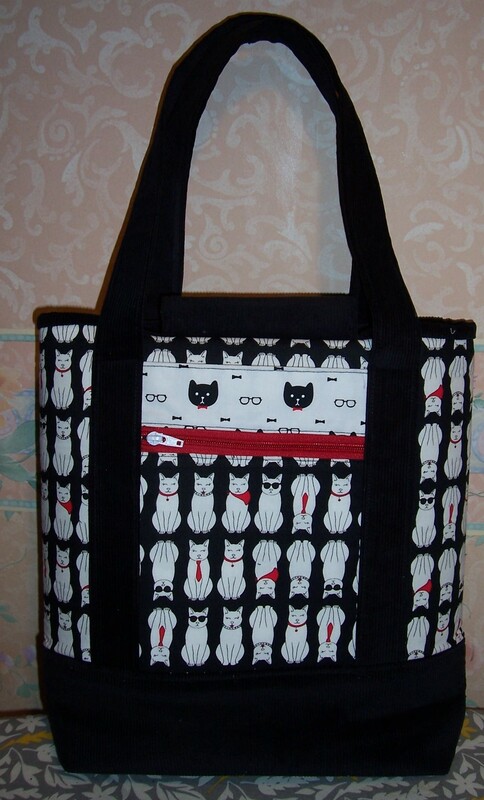 The Red background is earmarked for a Sew Sturdy Organiser bag as designed by Annie Unrein so stand by for a mammoth quilting session. 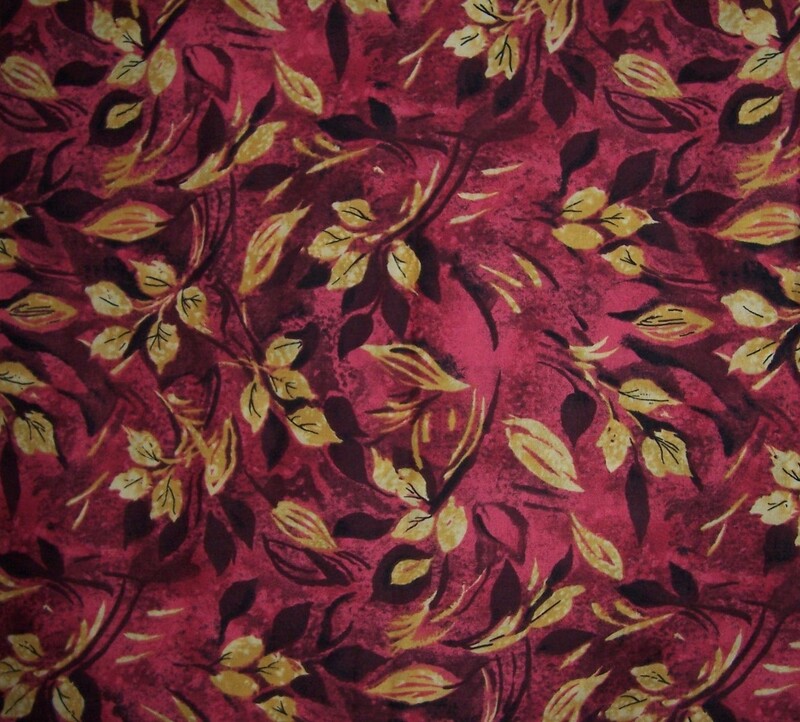 I plan to make a range of accessories in red-printed fabrics to go with my latest Brother (R) sewing machine. The organiser will be the piece de resistance! I bought the last of this Burgundy background Chrysanthemum printed Cotton Poplin. There are a good 4 metres of fabric, plenty to make my TNT Bettina dress with full circular skirt. 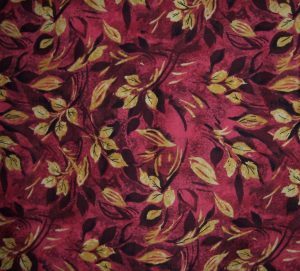 I will probably make the lined cap sleeves as this print is ideal to wear with a fantastic cable patterned cardigan that a good friend knitted for me last year. 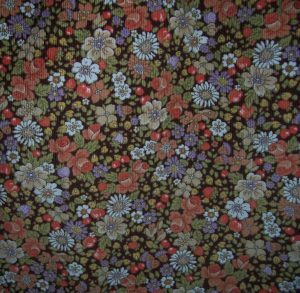 Again, I bought the last of this printed cotton, “Mystic Breeze” by the Balson-Hercules Group. There is enough fabric to make a 3/4 length sleeved blouse. Reviewing just some of the purchases from 2016 that never got made up I have a length of beautiful wool blend Green-based jewel-coloured tapestry-type fabric in an Aztec-style weave that I bought from SEW OVER IT. Unfortunately, I mis-read the pricing thinking it was per metre when it was per half-metre. I ordered 3 so have ended up with just 1.5metres x 152 cms wide. I will have to check through my patterns to find a short length coat or long-line jacket to make up this fabric – ready for the Spring. The colour is a little more Emerald than shows in this picture below but you get the idea. Also on reviewing my “recent purchases” stash I came across these two lengths that are calling to be made up. 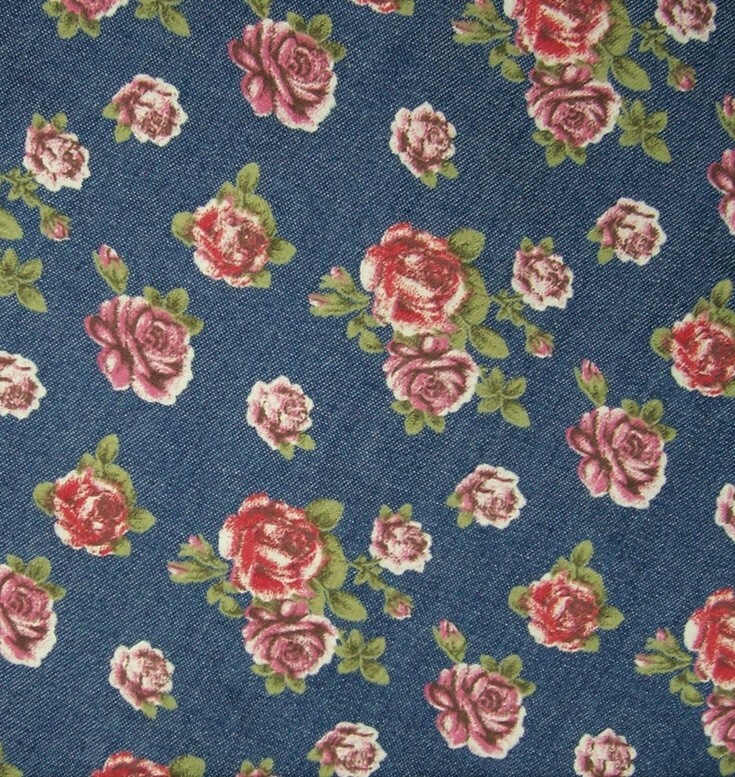 First a pretty mid-Blue floral-printed chambray/light denim fabric that I think I bought from M Rosenberg & Son when visiting the Quilt Show at Sandown Park. There is sufficient to make a button through dress to replace an ancient M&S dress that I bought about 20 years ago and is really ready for the “cut up and recycle” bin. The second length is a very stretchy textured polyester jersey. 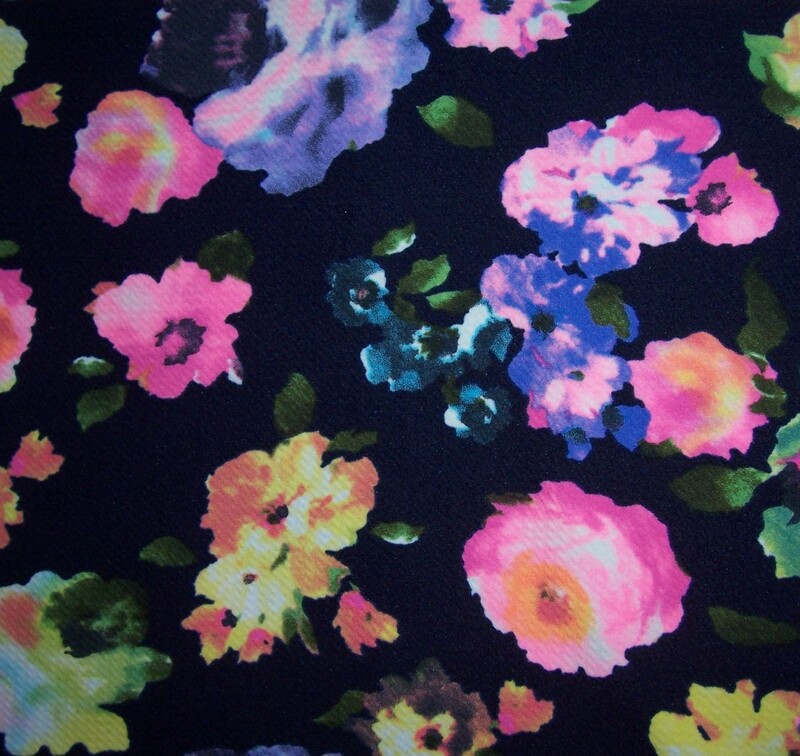 Floral print again on a Dark Navy background. Although the fabric is very wide it is not over long but should be sufficient to make a similar tunic top to the Sparkly Sequinned Stars jersey that I made for New Year’s Eve. Whilst the overlocker is still threaded up with 4 Black threads there is a good chance that this top will be sewn sooner rather than later. So that’s it for now. 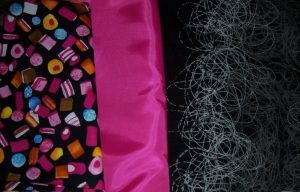 This selection of fabric is just the tip of the iceberg from my stash. Here’s hoping that I will be able to convert the quantity into quality garments. When the Tilly and the Buttons “Cleo” dungaree dress pattern was released it immediately called to me. I checked out various versions that other bloggers had made and finally, on 28th December I managed to find time to cut out and stitch my own version. I used the size 8 knee length version as a starting point and adjusted up to my personal dimensions . Included in those adjustments, I increased the width of the “bodice” at the front, though later discovered that this was a mistake and involved me in making alterations to a completed garment. Gasp with horror as I don’t do alterations!! I used some lovely soft Black Corduroy from my stash and a contrasting Black background floral print cotton left over from a previous project, for the pocket linings and facings. I included both the front breast pocket and the two back hip pockets. The dress was a simple construction. 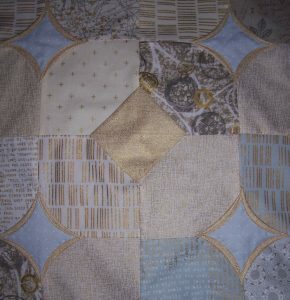 All major seams were stitched then flat felled into place. I stitched the entire length of the front seam and omitted the short slit. Turning the straps through to the right side was very time consuming and next time I will press and fold then top stitch them in place without turning through.The pockets, straps and around the top of the bodice part were all double top-stitched in Black. The hem was overlocked and machined in place. 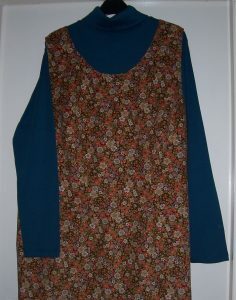 I used a Nickel set of Bib and Brace hardware that was in my stash and have worn the dress with Black leggings and a Red polo neck sweater. Comfortable and easy to wear although I did find that I kept fiddling with the bib and brace so will have to machine them in place. I also found that the reverse of the fabric “grabs” onto my sweater and leggings, despite wearing a short slip. 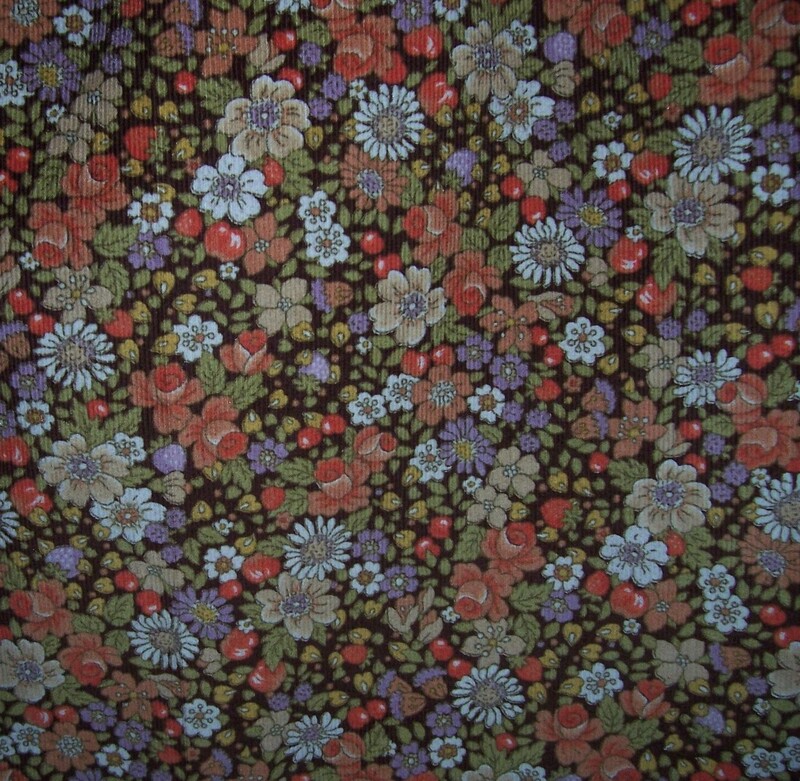 If I make this dress again in corduroy (or needlecord), I will line with anti-static lining. In addition to a nice new dress to wear on Christmas Day, I also like to have a special top to wear on New Year’s Eve. 2016 was no exception. 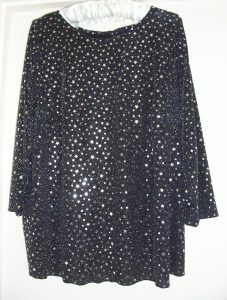 When buying the Monochrome jersey for the Christmas Day dress, I tucked a length of Star Sequinned Black Jersey fabric into my bag. This is a very stretchy jersey base, covered in sparkling stars and “glitter”. Due to the “in your face” fabric, there was no need for a complicated tunic top and in any event I had purchased only 1.5m of the wide-width fabric. I turned to my TNT Bettina bodice and hacked it! First I extended the length by 8inches beyond the waistline and then included the long sleeves in the pattern layout. 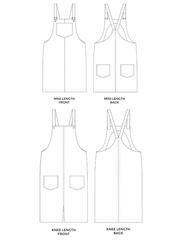 I would not use any facings as the neckline, sleeves and hem would all be turned to the inside and top stitched. The construction process was REALLY quick! I used a small lightning stitch on the shoulders whilst including some narrow georgette ribbon to stabilise the seam. The bust darts were also sewn on the sewing machine. I did not stitch the body darts as I wanted the top to be loose and “flowing”. 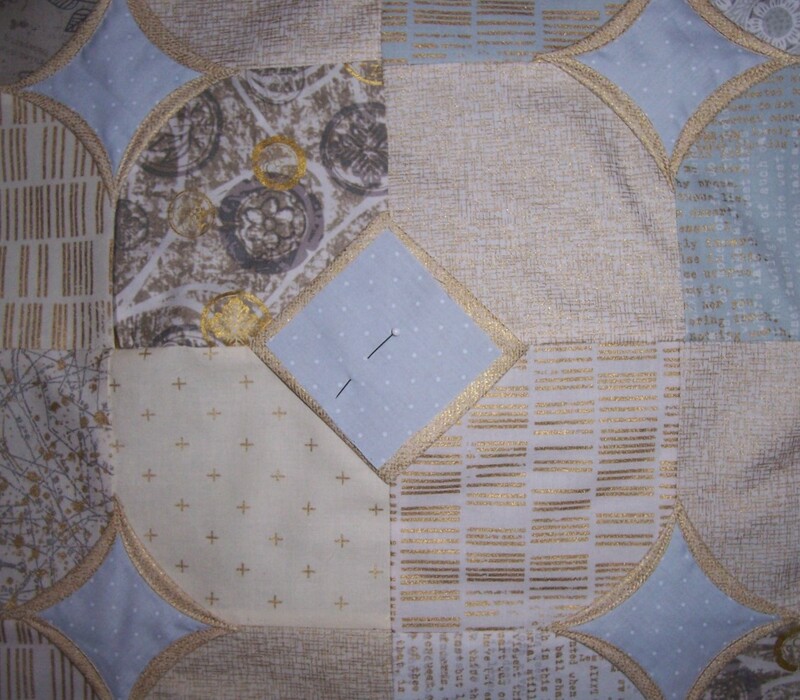 The remainder of the construction was done on the 4-thread overlocker. I overlocked the raw edges at the neckline, sleeves and hem. The sleeve hems were turned to the inside before twin-needle stitching in place. As I wanted more control over this extremely stretchy fabric, the neckline and tunic hem were hand tacked to the inside to prevent stretching out of shape. The tunic top is lovely to wear, so comfortable as it just skims the body and I almost forget that I am wearing it. Once completed I modelled the tunic for my husband who commented how nice it was. Unfortunately, I was unwell on New Year’s Eve so the modelling session was the only time I have worn the tunic – oh well, at least I have a great top ready to go at a moment’s notice should the need arise!